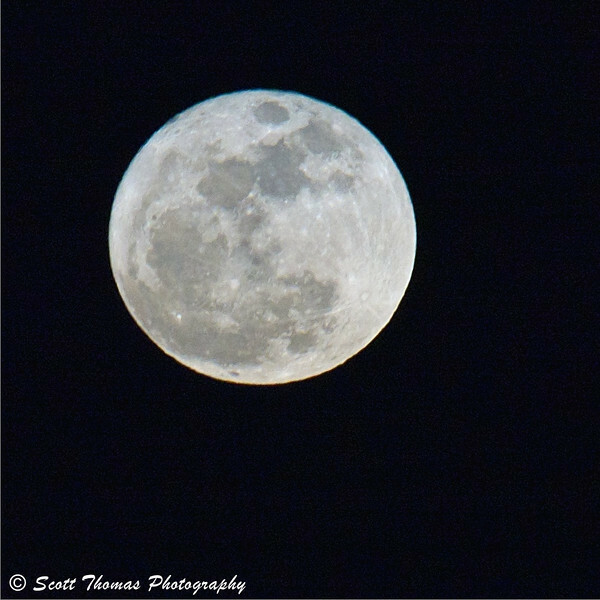 The Super Moon of March 19, 2011. Nikon D70/80-400VR, 1/100s, f/11, ISO 800, EV 0, 400mm focal length (600mm in 35mm) and cropped. The Internet is filled with Super Moon photos from last Saturday night, March 19, 2011. My area finally had a clear night and, like many other photographers, headed out to capture the moon at it’s closest distance to Earth. This happens rarely when the moon reaches it’s perigee at the same time it is full. My first problem was finding a good location facing east. I enlisted the help of an iPhone app called LightTrac which gives times of both Sun and Moon rise and sets from any location on Earth. If features Google maps and shows the angles and direction of the events as well as elevation above and below the horizon. With this app, I decided to go for a very open location overlooking the Montezuma National Wildlife Refuge (see below). 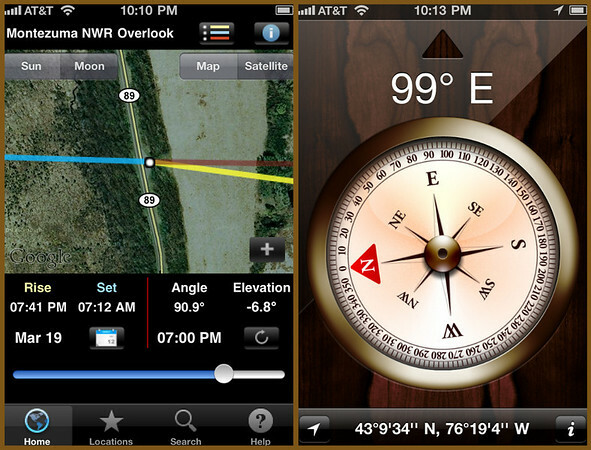 iPhone 4 apps used to track the Super Moon: LightTrac (left) and Compass (right). The LightTrac app screen shot shows where I was. The yellow line gives the direction of when and where the Moon would rise. The shaded red line gives the current position of the moon at the time. The negative elevation number indicates the moon was still below the horizon. I used the slider to coincide with the time of moonrise which gave me the angle of 97 degrees. I switched over to the Compass app to line up my camera. At first, I had set up where some trees would have blocked the moonrise. I moved over about 15 feet to the south after consulting the compass. This allowed me to watch the Super Moon rise majestically over the refuge. As if on cue, a male woodcock started his mating call adding to the magic of the very still and chilly last night of Winter. This entry was posted in Nature, Weekly View and tagged 80-400mm, app, apple, astronomy, compass, iphone, lighttrac, montezuma national wildlife refuge, moon, new york, night, nikon D70, super, vr, winter. Bookmark the permalink. hehehe…you went to a lot more trouble than I did. I just went out into the front yard and waited. The marvels of modern technology. I just stepped out the door, moved over to the neighbor’s yard across the street to avoid the power lines, and hoped for the best. I wish I could have just stepped out of my door for this one. I did way more work than I needed but had fun. The refuge was a beautiful location. Ducks and geese would glide in as the day turned to night. The woodcock serenade was wonderful. I saw some but they added the moon in later with software. The moon was big but NOT that big. I had some technical issues with the old camera and missed catching it as it rose. Will get it next month (weather permitting). Want to find an interesting foreground and when it is still light out. Not just the Moon but the Sun, too. You will know when and where the Sun rises and sets. I was like some of the other commenters and just went outside (fortunately at the right time). We had broken clouds but the moon was clear when it rose. Had I not been so lazy I would have taken a shot at it later in the night when it was overhead. It lit up the whole area. Ah, to live in Big Sky country. It was very bright and it lit up the whole marsh area at the refuge. You know the ol’ saying “everything is bigger and better in Texas”? In this case it’s not true! This so-called Super Moon was downright disappointing, because it didn’t look any different than any other time. It looked MUCH bigger Friday night, but of course I didn’t get a chance to go out to take pictures. I have a theory. Texas has moved past the International Dateline. Friday was Saturday. I am thinking when you saw the Moon on Friday, it was near the horizon. The Moon looked huge then. As for me, I just sent Babs out her door over on Torch Lake. I went to bed early so I could go out my door to Grand Traverse Bay for the moonset the next morning. Ha. Best laid plans. Scott, what would be the point of any of it if you couldn’t have a blast doing it? Excellent gadgets AND a peenting woodcock by the light of the Big Moooooon. That’s a memory. Babs got the kind of shot I will be looking to get sometime this year. It was a lot of fun and the woodcock, for all my gadgets, was the highlight of the evening. I waited outside in my Dad’s driveway to take the picture of the super moon also, luckily there’s 5 minutes that I saw, but not enough time for me to get a good shot and it disappeared into the thick dark cloud. Our weather did cooperate. The night before and the one following was cloudy. Your gadgets are cool! I have an iPod touch so I could probably try some of those out. The 400mm zoom seems pretty cool too. I wish I had thought to try to find the moon earlier in the evening. A beauty of a shot!